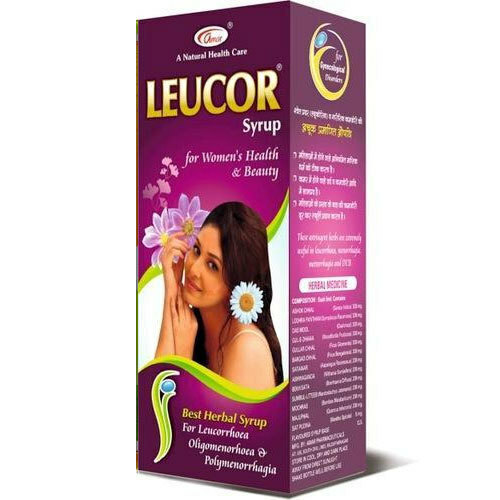 Leucor Syrup contains herbs which are helpful as natural menstrual regulator. It is helpful for all kind of leucorrhoea, menstrual problems and menorrhea. Helps to remove discomfort from abdominal pain, vaginal pain, stomach cramps, sweating, nausea, fatigue and diarrhea. Helps to support uterine function. Improve General Weakness loss of Appetite. Helps to normalize menstrual cycle. Helps to reduce heavy menstrual bleeding. By stimulating ovulation, it helps to boost fertility and reduce irregular periods.